Is it possible to buy all the skills? As there are quite a few skills available in the game, is it actually possible to buy all the skills? Below I have included a screenshot of my level 9 skill tree. As killing enemies earns experience points, which eventually lead to a level up and a skill point reward, it is a safe bet that you can earn enough skill points to buy all the available skills in the game, by killing enemies and completing quests. This is reported on the Twinfinite site also. it looks like the max level cap is level 50. By this point, you’ll have already earned enough skill points to unlock all of the available Skills. Upon reaching level 50, you’ll also earn a bronze trophy. It’s the final level-related trophy, so it’s a good sign that this is the max level cap in the game. The top row of skills all cost 1 skill point, the whole row costs 9 points. The second row skills cost 2 points, with a total of 18, and the last two rows of skills all cost 3 points each, totalling 54 point for both rows. So in all you'll need to earn 81 skill points to buy all the skills. Might be 80 in total, as I think Silent Strike is given for free. As mentioned by @Shaz in the comments, there is also a trophy for unlocking all the skills. Not the answer you're looking for? Browse other questions tagged horizon-zero-dawn or ask your own question. How do I unlock the “All Skills Learned” trophy after hitting Level 50? Is there a known issue with the Focus Tracking? How many enemies can I tag? What are the benefits/drawbacks of armor tiers? Where can I find a large number of fish? Is there a good spot to farm Health plants? Is there a vendor for animal parts? 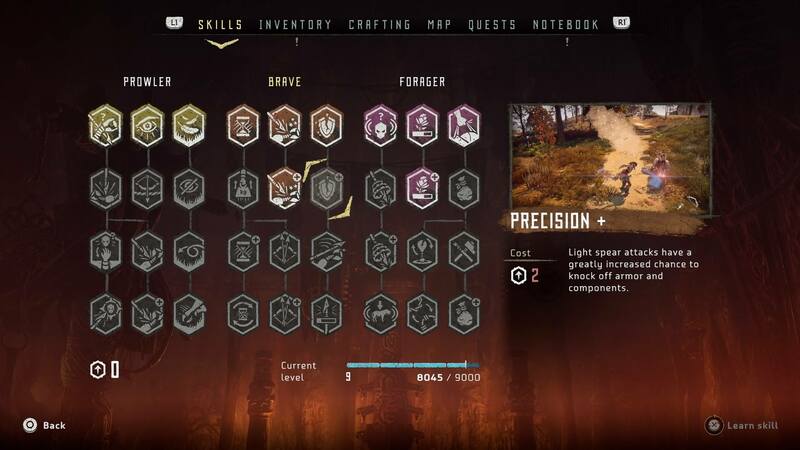 Do I need the Complete Edition of Horizon Zero Dawn to get all the items? Why are power cells unavailable for the Ancient Armory side quest after finishing the main quest? Still don't have enough skill points. What am I missing?